Welcome to Art and Patty.com. This site is updated sporadically yet dramatically whenever inspiration strikes! The most recent update entitled THIS OLD HOUSE was added in August 2005. 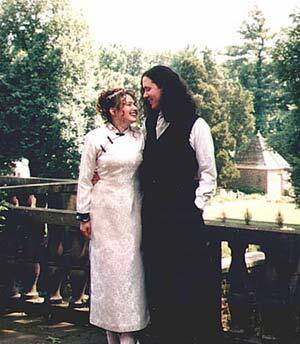 Elsewhere at ArtandPatty.com, you'll find photos from the July 2003 blessing of our wedding. We will soon add photos from our 2004-2005 trips to Las Vegas. You can also explore areas that contain samples of our artwork and other odds and ends that reflect our creativity and general kookiness. The popular VEGAS STAR TREK WEDDING portion of the site is slightly isolated from the main site by design, but don't let that stop you from checking it out. CLICK HERE to enter the site via our WEB JOURNAL.